Well today was an exciting day! 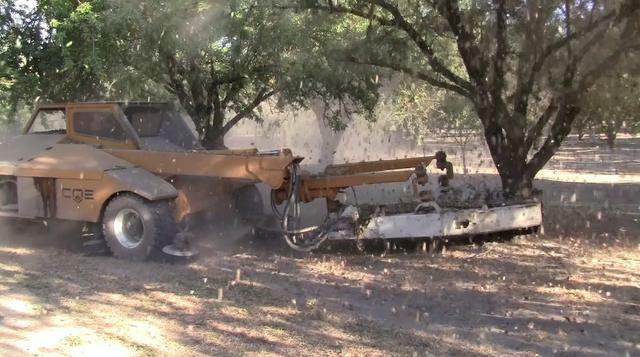 It's almond harvesting season!! All those strange looking machines all over the roads. I'm terrified one is going to pull out of the orchard and I'm going to squash one like a bug. So here is my plate. It was all so good. I may have went back for more of the pork jambalaya and beans. and then I had some cake, but I'll spare you the pictures of that. Mostly because I forgot to take any. I came home and attacked the laundry, the dishes and the living room. Watered the yard, dragged the extra bunk bed to the back of the house AND made dinner. We had Chicken Nacho Bake for dinner. I forgot to take a picture, but I've made it before. I finally talked myself into going for the couch to 5k run again tonight. The last time I went was early last week. I hardly exercised at all last week, what with the razor blades in my throat and all. So as a recap, week 4, is rather brutal. For day one I ended up walking for a few seconds of most of the runs. I made sure to start off nice and slow today and keep my pace slow. I wasn't going fast, but I ran ALL the running times. WOOT! I'm so proud of myself! I never thought I'd be able to run for 5 minutes at a time (well not since junior high when we had super strict PE teachers).